The sunset and ocean colors of Carmel come through in the work of Carmel’s treasured ceramic artist, Kathleen DeBord. 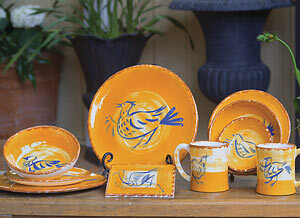 Her love of birds migrating through Carmel inspired this memorable design. Every one of Kathleen’s birds has its own character. They fly, sing, swim; you will have many favorites. Sold individually. All pieces are available in Marigold, Rose or Sea Green. These colors have a beautiful, resort casual feel whether at home, the beach or a woodsy retreat. These dishes are handpainted and custom made, and are sure to be among your favorite dishes. All pieces are dishwasher and microwave safe. * When ordering Oval Platter, please specify a tall bird (vertical) or short bird (horizontal) pattern. Oval Platter 16" x 11"